Here are some things that happen whenever a big bus network redesign is first proposed to the public. They are happening in the Dublin network redesign process right now, but to some degree they’ve happened on every project I’ve done over my 25-year career. People assume that the plan is more final than it is, so they feel they need to gather forces in angry meetings and attack us, when in fact we want their detailed comments so we can address them. Media headlines often inflame this confusion, with headlines about bus lines being “scrapped”. Unions representing bus drivers, understandably seen as experts in some circles, will often put out their own messages tied to their own interests. Some sympathetic person explains to me that people in their city or country are just crazy in some way, and I assure them that no, this is what happens everywhere, from Russia to the US to New Zealand, when a proposed network redesign comes out. Because what everyone is doing is completely understandable in their situation. Here, for example, is a deep dive into a current network redesign in Canberra, Australia (which I helped lay the groundwork for years ago). You will see all of the themes I’ve listed. What’s happened next, in all my projects, is that we collected the comments and fixed what was fixable, which turned out to include most of the details that had most inflamed people. In most cases that addressed enough concerns that the plan moved forward and was a success. It solved the problems it was meant to solve, and once people got used to it many of them discovered that it wasn’t as bad as they thought. That doesn’t always happen, though. Sometimes elected leaders panic at this point and stop the plan, leaving all of the existing problems in place. For me, there’s a reason to be happy about all the controversy: It means people care. The least controversial projects I’ve done were in very car-oriented places where few people (and no powerful people) cared what the buses did. I would much rather be dealing with controversy. The key thing is not to panic when we hear outrage at this stage of the process. While was it was especially inflamed by misinformation in Dublin’s case, it’s a normal phase in the conversation. And again, that doesn’t mean we’re not listening. The whole point is that we are listening, so we can make the plan better. The best of intentions lay behind the recent analysis of the availability of high frequency service, described by Jake Anbinder at TransitCenter. And as one of the original proponents of Frequent Network branding, I’m delighted to see organizations starting to care about whether transit is useful, rather than just whether it exists. But when we transit professionals design Frequent Networks and their standards, we think really carefully about what counts as frequent service. I insist that it always means every 15 minutes or better on both peaks and throughout the midday, but we have to have a sensitive local conversation about how late it extends into the evening, and how long on weekends. It’s easy to say that you want 15 minute service 24 hours a day, but when you look at your fixed resources, you’ll find that if you insist on that, your Frequent Network won’t cover enough of your city to be either useful or politically feasible. For service to count as frequent, by this analysis, it has to be frequent even at 3:00 AM. Why quibble about this? Because this chart caused some needless angst in the media. Among its worst outcomes would be to signal that frequent service is such a rarefied thing that most cities couldn’t realistically hope for it. It certainly obscures all the great work that’s actually being done to build realistic but useful frequent networks in many cities. 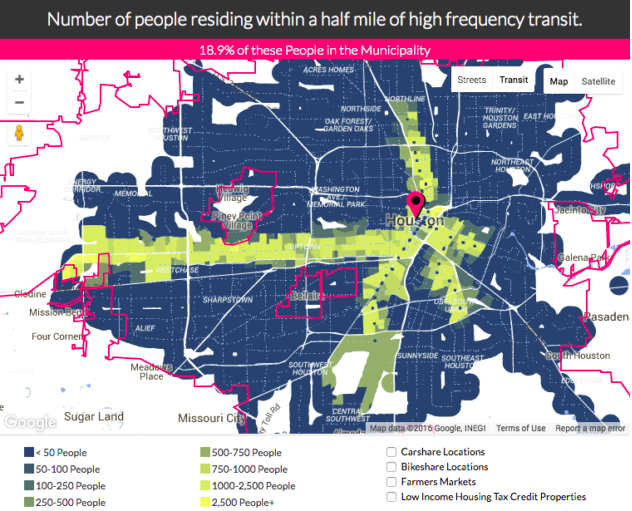 In Houston, according to TransitCenter’s analysis, while nearly 80 percent of people have access to transit at least a half mile away from their doorstep, only 18 percent of them have access to what the map’s algorithm considers the highly reliable, “high-frequency” service. By the AllTransit definition of high-frequency—service running at least every 15 minutes on average, 672 times a week—only one bus route, the Westheimer route, meets that standard, along with all three of Houston Metro’s light-rail lines. And it considered Houston to be one of the two “most notable” examples of that demographic skew. Ouch! Great basis for rage. But it’s not about what matters! When we designed the Houston network, our standard for frequent service was not 672 buses/week, and the map above illustrates why. If it had been, we’d have brought frequent service to too small a part of the city, and we could have fairly been accused of racial disparity. That’s why we didn’t! As it is, the Houston Frequent network (the red lines on this map) is abundant and citywide. It may not fit some abstract big-city standard, but it’s the fair and equitable way to cover most of Houston with frequent service given the transit agency’s resources, and it’s sculpted to hit inflection points on the frequency spectrum where ridership begins to take off. The same is true of many of the cities that “fail” the 672 buses/week test. TransitCenter is an excellent organization, by the way, and this showed in how open they were to this critique when I shared it in draft. In our correspondence they asked me what a good benchmark would be. I suggested “15-15-7”: 15 minute frequency, 15 hours a day, 7 days a week, plus 30 minute service for an additional 5 hours a day. That gives you a total service day of 20 hours, e.g. 5:00 AM – 1:00 AM. That’s only 490 bus trips/week, so their estimate of 672 is high by over a third. 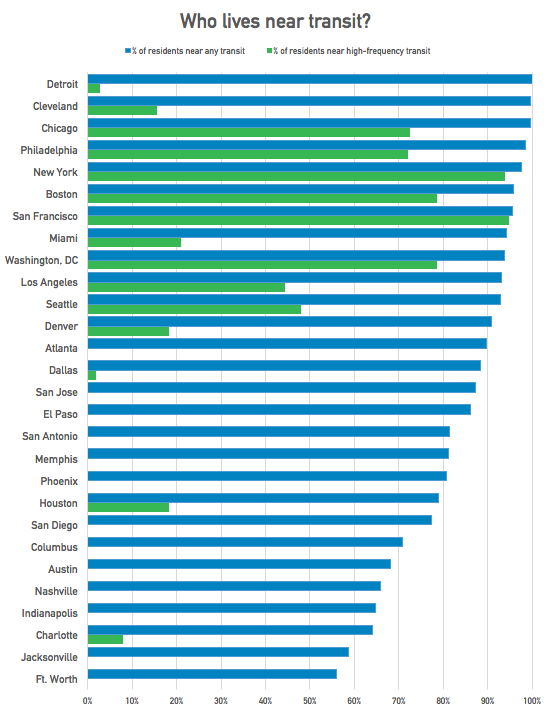 The chart would be totally different, and more useful at motivating change in cities that aren’t as dense as New York or San Francisco, if a standard around there had been used. In North America, the word downtown invites us to imagine the densest and most walkable part of any city, the place where transit and other non-car modes naturally thrive more than anywhere else. And where this is actually true, it's logical for all kinds of intercity and local transit services to focus there. But when we project this model of downtown onto every city, we encounter fatal confusions. Downtown implies a single place; there's just one per city or metro area. But some cities aren't like that. Los Angeles and Houston, two take two famous examples, have a place called downtown, but it's really just a slightly larger cluster of towers among many clusters of towers dotted across the region. Downtown in this model is not like a center of energy around which the whole city revolves. It's like the brightest of a bunch of stars in a constellation, and not even the brightest by much. So if you cling to the notion that downtown means "focal point of travel demand and especially transit", then you have to embrace the concept that an urban area may be a constellation of many downtowns. This is not just an American sunbelt idea. Most of the population of the Netherlands is in a single metro area called the Randstad; it's made of many small cities each with its own downtown, with a shared airport near its centroid. Many Asian cities are so uniformly and extremely dense that almost any point in the city could be called downtown, so long as there is some mixture of uses. All of Paris is about equally dense, with government, business, and retail districts all over the city and the tallest towers around the edge of it, so good luck finding "downtown" there. In Citylab, Eric Jaffe gives us the supposedly bad news that the proposed Dallas-Houston High Speed Rail (HSR) line won't go to "downtown" Houston. Instead it will end at Northwest Mall, just outside the I-610 loop in the northwest of the city. the proposed terminal is close to the centroid of Houston as a whole. It's also very close to Uptown-Galleria, the region's second downtown, and to Northwest Transit Center, the busiest transit hub in the western 2/3 of the city. The bigger challenge, for folks from strongly single-centered cities, is to notice the limits of the term downtown. As cities grow, there is no correlation between the sustainability of a city and its single-centeredness. On the contrary, single-centered cities present huge problems for transportation, because they use capacity so inefficiently. New York, for example, is spending over $10 billion on a project to fit more Long Island commuter trains into Manhattan, and to put them closer to jobs there. The demand is mostly one-way, so this requires either storing trains all day on expensive Manhattan real estate, or running them all empty in the reverse-peak direction. It's very inefficient compared to the transit problem in a multi-centered place like Paris or Los Angeles, where demand is flowing two-way most of the time. So growing a single downtown isn't the key to becoming a great transit city. Quite the opposite, it's best to have a pattern of many centers, all generating high demand, and supporting balanced two-way flows between them that let us move more people on less infrastructure. This is the great advantage of Paris or Los Angeles or the Dutch Randstad over Chicago or Manhattan. So remember: when it comes to the efficiency and abundance of transit — or roads for that matter — "downtown" isn't all it's cracked up to be. For transit, big clumps of density and walkability are great, but several are better than one. They shifted the percentage of the network devoted to ridership goals from 55% to around 75%. They vastly expanded the reach of frequent service so that it connected 1 million people with 1 million jobs. They expanded weekend service, especially Sunday service, so that the daytime and evening service levels on those days are almost identical to service on weekdays. We now have the first ridership data, in the form of a report comparing ridership each month to the same month a year before. Since the New Network was implemented in August, the first data showing the impact is the comparison of September 2015 to September 2014. Here it is, from METRO's monthly report. Note that the "METROBus – Local" is the category of service dramatically changed by the redesign. Rail is soaring, but look at the buses! Red ink! What's wrong? Were the consultants fools? Not at all. This is exactly what we'd expect. In fact, it's consistent with the New Network having a positive impact on bus ridership. Here's why. First of all, ridership is surging on weekends, especially Sundays. That's because we grew weekend service dramatically and made it simpler. Local service levels are now essentially the same seven days a week. (The only exceptions are the weekday rush hour period, when they're higher, and that weekend service starts a bit later.) We knew that weekends were a huge area of suppressed demand that could be tapped at low cost, and we were right. The weekend ridership growth in the first month is especially gratifying, because …. When the Houston METRO Board asked me for an educated guess of ridership impact, I said +20% after two years of well-marketed operation, and net of the impact of other events. This was simply a very educated guess based on my experience. However, if you prefer modeling, I can offer that a run of the regional model later came up with the same answer. It's commonly observed, in our business, than when you make any big change, you may get a downtick in ridership in early months, even if the longer term path will be positive. Humans are incredibly habit-driven beasts, and it takes time for them to see new opportunities. Also, the most profound and transformative impacts of a frequent network happen as people start to make location choices in response to it, so that frequent lines come to be populated by people and businesses that value transit. None of that happens in the first month, but a fair bit is starting to happen in two years; the bigger payoffs, of course, are even longer term. So a first month downtick is exactly what we'd have expected. Am I surprised that the local bus ridership is down 3.9% overall.? Contextual changes — events unrelated to the New Network — also occurred. The biggest was the dramatic drop in oil and gas prices. Low gas prices tend to depress ridership, but in Houston they also meant severe layoffs in an economy dominated by those industries, which also reduced demand. Two major light rail lines opened, intentionally shifting ridership from heavy bus lines to rail. The New Network removed services running parallel to light rail lines, further encouraging people in those corridors to use rail instead of bus services. Let's look at those in detail. Weekday local bus ridership is down 8.4% but Park-and-Ride express ridership is down 3.8%. That's interesting because the New Network made almost no changes to the Park-and-Ride express system, which is mostly oriented toward outer suburbs that are unserved by the local system. Ridership always shows some sensitivity to retail gas prices, going up when driving gets more expensive and down when it gets cheaper. Layoffs in the oil and gas industries — a major part of Houston's economy — meant fewer people commuting. So we should have expected a ridership drop regardless of the New Network. Again, it would be great to correlate the P&R ridership losses with downtown job losses. When rail is introduced to replace a very busy bus line, of course the high bus ridership becomes rail ridership, and you should expect total bus ridership to go down. That doesn't mean buses are failing; it means they succeeded so well that a higher-capacity transit technology was needed, and they handed off their role to that new technology. Two new light rail segments opened in the year under study. The Green and Purple Lines, both oriented toward the southeast of the city, opened in May 2015. These obviously caused a shift of bus ridership from buses to light rail, as they were expected to. Another reason to expect bus ridership to drop and rail to grow is that the New Network deleted bus services that compete with light rail. Some of these right alongside the Red Line through the densest parts of inner Houston, inevitably drawing some passengers from rail for various reasons. The New Network also introduced bus-rail connections for what had previously been bus-bus connections. Every time you do this, bus boardings turn into rail boardings. That's probably a big part of the ridership growth on the Red Line, since this line did not change during the 2014-15 year. An internal frustration of American transit statistics is that rely so heavily on counting boardings, when what everyone cares about is completed journeys. When you transfer, you are two of the former but only one of the latter. If we increased transfers, that would suggest that the drop is even worse that the numbers make it appear. My sources tell me that a preliminary look at this suggests it's a non-issue; the amount of transferring looks about the same as before. We made a big deal about how the New Network would require and encourage more transferring for some existing trips. That statement was to manage the expectations of existing riders, but it doesn't mean we expected transferring to rise, and it's great to hear that the rate is about the same. After all, the New Network also eliminates many potential transfers for trips to non-downtown destinations, and the grid replaces many two-transfer trips with one-transfer trips. A downtick in ridership right after a major service redesign is routine. Because humans are so habit-driven, people who find the new network less convenient disappear as riders while the vastly more who will find it more convenient take some time to figure that out. I would not have been surprised at a drop of a few percent. Indeed the total drop in local bus ridership, counting the weekday drop and the weekend surge, is under 4%. Major bus markets shifted to light rail, both through new rail lines and deletion of bus lines competing with existing rail lines. Suggestions of a contextual bus ridership drop unrelated to the New Network, tied to falling gas prices and how that affects the Houston economy. … I don't think we know that any of an 8% drop in weekday bus ridership can be attributed to the New Network. And compared to what we expect one month after implementation, that's a rousing success. * Sadly, we can't separate these two effects because light rail opened just as the university year was ending, so September is both the first full month of the New Network and the first full month of light rail running with the universities in session..
Tonight — in the wee hours of August 16, 2015, it all happens. The complete redesign of Houston's bus network, the result of a design process that I led and of extraordinary Board and staff effort, goes into effect overnight tonight. Over a year of planning, months of difficult public debate and revision, and finally months of intense work at implementation, all bears fruit on Sunday, August 16, when practically every bus line in Houston changes. For the better. Frustrating and obsolete transit networks seem eternal, unchangeable, until one night they change. Andrew's link is to Dagen-H, the strange day in 1967 when Sweden switched from driving on the left to driving on the right. Swedes had long been driving on the left with left-hand drive cars, putting the driver at the side of the road, and all their neighbors drove on the right. And yet still, opposition to such an obvious move took decades to overcome. Houston's new network was equally obviously needed, equally fiercely debated, and it's a credit to many that we aren't waiting any more decades for it. No, not everyone is happy. Yesterday's Houston Chronicle article led with a photo essay about an unhappy-looking man whose stop is disappearing. You'd think we'd abandoned him, but in fact his vanishing stop is three blocks from a new light rail station, and within blocks of high-frequency transit in all directions. As often in ridership-increasing redesigns, he'll have to walk further to better service that will take him many places faster. Is this really too high a price to pay for a network that provides seven-day-a-week all-day frequent service linking 1 million people to 1 million jobs, up from less than 1/2 million today? Fortunately, if you get past the photos, Dug Begley's article is fair; I appreciate the good job Dug has done throughout this long process. The quality of local reporting makes a huge difference. There's a happy irony in starting the new network on a Sunday. The idea behind this routine practice is to start the change on a day when things are quiet, before facing a busy day. But in Houston, we don't want Sunday to be quiet. This network's big move is not just a liberating frequent grid over most of the city — designed for everywhere to everywhere travel over this vast and decentralized place — but also a historic gamble on weekend service. Weekend daytime service will be largely the same as weekday — every bit as frequent and functional, except of course that it won't have peak-only services. It's a huge expansion into the weekend, and also into the evening. Why move into these stereotypically low demand times? Because ridership on poor service is no indication of demand. You have to look at the life of the city, and especially at the lives of all the people most likely to find transit useful. Houston is bustling on weekends, and all kinds of people benefit from access then. Low-wage workers in particular almost all work a weekend day, because the sectors that employ them (entertainment, restaurants, shopping, port-related industry, etc) don't sleep on weekends, and often have their peak demand then. But it's not just for them. A seven-day pattern means that anyone can get anywhere on any day, and probably by pretty much the same path. Finally, amid all the short-term excitement and frustration, and all the demands that we be able to pass judgment on the outcomes by next Tuesday, let's remember that this is a long term play about prosperity, sustainability, and affordability by empowering people to choose transit when they choose their location. A big frequent network means more places where people can choose to locate if they value good public transit — so many places, in fact, that many of them will remain affordable. That sets off a positive feedback loop that leads to much higher ridership, more affordable lives, and more support for urban redevelopment, and that makes those things more permanent. This was my baby once, but it's been over a year since I let go of it, and I can't take all that much credit anymore. The plan itself was the work of a team of consultants, facilitated and sometimes led by me but ultimately managed by the excellent Geoff Carleton of TEI. The real transformation, though, was the work of a courageous Board, a hard-working and resourceful METRO staff, diligent reporters, and above all many thousands of citizens who cared enough to engage with the plan, understand the tradeoffs, and help to make it better. Welcome, Houston, to a totally new transit system. And for everyone else, remember: If your bus network is obsolete, you can reimagine it to be more liberating and useful, and also to be more relevant to building the city you want. My hometown, Portland, did it in 1982, and the starter line of our famous light rail system would have failed without it. Auckland, New Zealand is doing it now. Ask us how! And many other cities, like Los Angeles and Portland again, have networks that are already well-designed but badly underfunded given their potential. Almost everywhere in the world, buses are most of the transit system, and they are the the only tool that can radically liberate vast numbers of lives, at a manageable cost, while also treating workers well. Unlike most major infrastructure, bus improvements can also happen soon, and can be spread over most of a city. It's a crime not to make the most of them. How do the network changes affect your trip? Here's a great way to help people understand how a transit service change or project will affect them. Houston METRO has released a new tool to help people understand the upcoming major changes to the city's transit system. It puts two trip planners side-by-side: one routing via routes in the existing network, the other via the routes of the New Bus Network. Houston's transit network is about to change dramatically, and everyone is going to have to learn how to use the new one.This lets anybody quickly compare different trips trips to see both how a trip will go in the new system, and how long it will take. It could be a great educational tool in the public consultation phase, not just when implementation is occurring. It can also make the tradeoffs implied in the system redesign explicit. For example, in the trip above, a grid movement in southeast Houston is now much faster due to the reduced waiting times on frequent network routes in the area. Other transit systems implementing major changes would do well to build similar apps. However, while the dual trip planner is great for understanding how the changes effect specific trips, it is less useful for developing a sense of how the overall mobility level changes across the city with the new network. As an extension of this same idea, a companion tool could be developed that would compare the transit isochrones of different points in Houston in the existing and new networks. Not only would a person be able to understand how specific trips from one point to another change, but how the area of the city (and all of the opportunities located within it) accessible by transit changes as well. Houston’s reimagined network: don’t let us make it look easy! It's great to see the national press about the Houston METRO System Reimagining, a transformative bus network redesign that will newly connect a million people to a million jobs with service running every 15 minutes all day, with almost no increase in operating cost. Last week, when the Houston METRO Board finally adopted the plan for implementation this August, I was in New Zealand advising Auckland Transport executives on how to roll out a similar plan there, one that MRCagney and I sketched for them back in 2012. Advising on these kinds of transformations, and often facilitating the design process, is now one of the core parts of my practice. And here is my most important piece of advice: Don't let anyone tell you this is easy. Much of the press about the project is picking up the idea, from my previous post on the subject, that we redesigned Houston's network to create vastly more mobility without increasing operating cost — "without spending a dime," as Matt Yglesias's Vox piece today says. An unfortunate subtext of this headline could be: "Sheesh, if it's that easy, why didn't they do it years ago, and why isn't everyone doing it?" Money isn't the only currency. Pain is another. These no-new-resources restructurings always involve cutting some low-ridership services to add higher-ridership ones, and these can be incredibly painful decisions for boards, civic leaders, and transit managements. Civic officials can come out looking better at the ends of these processes, because the result is a transit system that spends resources efficiently in a way that reflects the community's values. But during the process they have every reason to be horrified at the hostility and negative media they face. 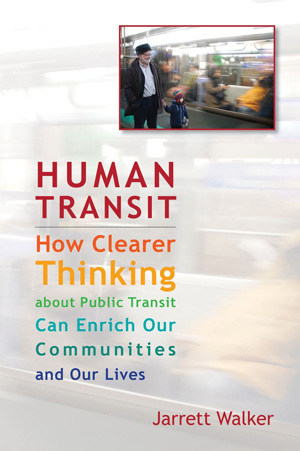 If you're on a transit board, here's what these transformations mean: Beautiful, sympathetic, earnest people — and large crowds of their friends and associates — are going to stand before you in public meetings and tell you that you are destroying their lives. Some of them will be exaggerating, but some of them will be right. So do you retain low-ridership services in response to their stories, and if so, where does that stop? I'm glad I only have to ask these questions in my work, not answer them. For a decade now I've been helping transit agencies think through how much of their service they want to devote to the goal of ridership and how much they want to devote to a competing goal that I call coverage. Ridership service should be judged on its ridership, but coverage service exists to be available. Coverage service is justified partly by the political need for everyone (every council district, member city or whatever) to have a little service, because "they pay taxes too," even if their ridership is poor. But it's also justified as a lifeline, by the severity with which small numbers of people need it. In the early stages of the Reimagining project, I facilitated a series of METRO Board and stakeholder conversations about the question: How much of your operating budget do you want to spend pursuing ridership? I estimated that only about 55-60% of existing service was where it would be if ridership were the only goal, so it wasn't surprising that the agency's ridership was stagnant. I explained that the way you increase ridership is to increase the percentage of your budget that's aimed at that goal. And if you're not expanding the total budget, that means cutting coverage service — low ridership service, but service that's absolutely essential to some people's lives. In response to a series of scenarios, the Board told us to design a scenario where 80% of the budget would be devoted to ridership. That meant, of course, that in a plan with no new resources, we'd have to cut low-ridership coverage service by around 50%. Mostly we did that not by abandoning people but certainly by inconveniencing some of them. But there was no getting around the fact that some areas — areas that are just geometrically unsuited to high-ridership transit — were going to be losers. We didn't sugarcoat that. I always emphasize, from the start of each project, how politically painful coverage cuts will be. The stakeholder committee for the project actually had to do an exercise that quantified the shift of resources from low-ridership areas to high-ridership ones — which was also a matter of shifting from depopulating neighborhoods to growing ones. They and the Board could see on the map exactly where the impacted people were. And exactly as everyone predicted, when the plan went public, those people were furious. Beyond furious. There really isn't a word for some of the feelings that came out. Houston had it much worse than most cities, for some local reasons. Along the northeast edge of inner Houston, for example, are some neighborhoods where the population has been shrinking for years. They aren't like the typical abandoned American inner cities of the late 20th century, where at least there is still a good street grid that can be rebuilt upon. In the northeast we were looking at essentially rural infrastructure, with no sidewalks and often not even a safe place to walk or stand by the road. Many homes are isolated in maze-like subdivisions that take a long time for a bus, or pedestrian, to get into and out of. And as the population is falling, the area is becoming more rural every year. I feel the rage of anyone who is trapped in these inaccessible places without a car. I also share their desire to love where they live, and hope my description hasn't offended them. But I can't change the geometric facts that make high-ridership transit impossible there, nor can I change the reality of their declining population. And that means I can't protect civic leaders, elected officials, and transit managements from the consequences of any decision to increase the focus on ridership. Increasing your transit agency's focus on ridership, without growing your budget, means facing rage from people in low-ridership areas, who will continue to be part of your community. Houston's situation is worse than most; less sprawling cities can generally prevent any part of the city from depopulating in the context of overall growth. But in any city there are going to be less fortunate areas, and the disastrous trend called the "suburbanization of poverty" means that increasing numbers of vulnerable people are forced to live in places that are geometrically hostile to high-ridership transit, and thus demand low-ridership coverage service. So don't let anyone say this was easy. What's more, in Houston it was easier for me than for anyone else involved, which is why I'm uncomfortable when Twitterers give me too much credit. I flew in from afar, facilitated key workshops for the Board and stakeholders, led the core network design process, and got to go home. It was the the Board, the management, the key stakeholders and the local consultants led by TEI who had to face the anger and try to find ways to ease the hurting. Was it worthwhile? I was very touched by what METRO's head of planning, Kurt Luhrsen, wrote after the Board's decision. I am overjoyed for the citizens of Houston. Particularly those who are dependent upon the bus and have been riding METRO for years. Their trips to the grocery store, the doctor’s offices, work, school, church, etc. take way too long and are usually way more complicated than they need to be. Today, with this Board vote, Houston took a giant step toward making these citizens’ lives better. That simple fact, making people’s lives better, is why I love my job in transit. It is where I draw my inspiration and today definitely recharged my batteries a bit. I am also very proud of our Board, METRO employees, our consultants, our regional stakeholders and many others who worked tirelessly to make this action today possible. These types of projects are difficult, that’s why so few transit agencies really want to do them. But today we did it. This plan will improve people’s lives, and I am so thankful that I got to play even a small role in it. I, too, am thankful for my small role in guiding the policy and design phases of the process. I listed, here, some of the key people who really drove the process, all of whom worked much harder than I, and who faced much more ferocious public feedback than I did, to bring the plan to success. Transit in Houston is about to become a completely different thing, vastly more useful to vastly more people's lives. But don't let anyone imply this was easy. It was brutally hard, especially for the Board and staff. Nobody would have done it if it didn't have to be done. Over the past two years, our firm has worked as a member of a diversely skilled team to help Houston METRO comprehensively redesign the city's transit system (look back to this post for the backstory). Houston is a dynamic, fast-growing city, where despite a reputation as a place where one must own a car to live, many areas have developed land-use characteristics indicating a large, untapped market for quality transit. This project has sought to design a transit network which can deliver the type of mobility outcomes current growth patterns demand, through a extensive Frequent Network grid. Today, we are proud to share the news of the unanimous passage of the final plan by METRO's Board of Directors, with implementation on track for August 2015. In the history of transit in North America, top-to-bottom transit network redesigns are very rare, particularly for a city of the Houston's size and national importance. This is a great day for Houston, and will be a fascinating case study for transit in North America.